Karina didn’t grow up moving from base to base, or watching her father deploy overseas, but the impact of her father’s service on her life is undeniable. Several years before her birth, her father, Sgt Vincente Hinojosa, was wounded in a mid-air helicopter collision that changed his life forever and brought his dream of a military career to a halt. He medically retired from the Marine Corps and moved on to a career in banking – but his Marine spirit and resilience remained. Karina witnessed her father’s experience recovering from his injury and has always been inspired by his determination and continued strength. Today, she’s confident she can overcome her own challenges and is determined to give back to others along the way. With the help of the Scholarship Foundation, Karina is pursuing her bachelor’s degree at California State University Channel Islands. She works part time to help her family and is leading her peers in her role as student government president. Upon graduating, she plans to pursue a career in special education in order to empathize with and provide a strong personal connection to students with disabilities. In reflecting on her father’s journey, Karina remembers the days where he felt well enough to get out of bed, get outdoors and golf – something they enjoy doing together. 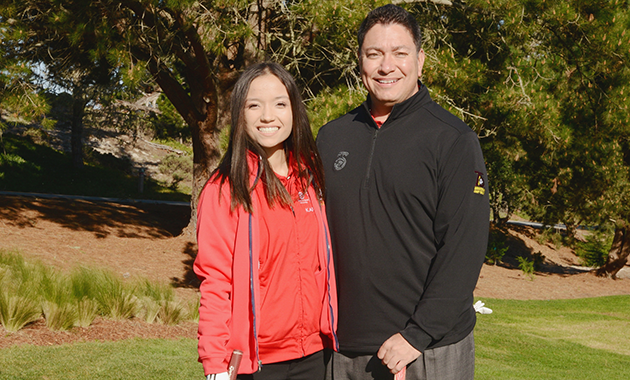 That’s why we were so thrilled to welcome Karina and Sgt Hinojosa on the golf course at our Patriots at Pebble tournament in California, where our Marine Corps community gathered to celebrate Marines and their families, and raise money for future scholarship recipients. Karina served as an excellent representative for her fellow Marine Scholars, and we’re honored to invest in families like hers every day.